TIFF is an abbreviation for Tagged Image File Format. It is a raster file format for digital images. TIFF includes so called “tags” which either indicate the simple geometry of the image, like its size, or define how the data is arranged and various image compression options. This option allows to include all sorts of image formats in the file. However, when TIFF was first introduced, programmers were not eager to invest the time to support all of the options. As a result the lowest common denominator soon became "the" TIFF, and even today the vast majority of TIFF files, and the code that reads them, are based on a simple 32-bit uncompressed image. Nowadays TIFF has become the de facto standard graphics format for high color depth (32-bit) graphics and is widely used in image manipulation applications. 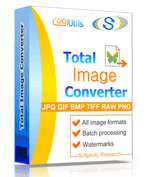 When you want to convert your TIFF images to JPEG, BMP, PNG, PCD in batch use Total Image Converter. It convert any number of TIFF files at one go. Besides, you may add logos or text, crop, resize and rotate youe images. Get your free copy now.